Make Water Safety Your Priority. You can do this by swimming in areas with a lifeguard, always swim with a buddy, make sure you wear a lifejacket if you are boating, and avoid alcohol. Prevent Unsupervised Access to the Water. Put a fence around your pool with a gate, or cover it if it is an above ground pool. Make it inaccessible to others when you are not around. Maintain Constant Supervision. Watch your children even if there is a lifeguard and always stay an arms length away from small children. Know What to Do in an Emergency. Always check the pool first if someone is missing and then call 911. Every second in the water counts. It’s a great idea to enroll in a CPR class. You never know when you may need it. Your friends at Storage World wish you a safe and happy summer! 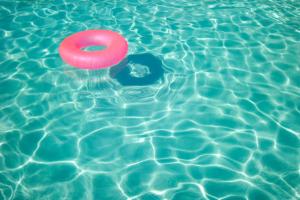 Don’t forget to store your floats, boats, and pool supplies with us at the end of the summer!